More than any other team in sports, Alabama football feels the most futile to root against. Over and over, they’ve stamped out nascent comebacks with two well-timed turnovers or turned a 14-10 game into a 28-10 game in two minutes of work. These are the sorts of ways you can win games when you’re bigger and faster than your opponents. The first 95 percent of this win probability graph accurately encapsulates how punishing Alabama can be. Tonight, they had one of those moments. Clemson had just scored with 4:38 remaining, saddling Bama with their first fourth-quarter deficit of the season. At this point in the game, Clemson had all the momentum, scoring 21 points to Alabama’s seven since Alabama took a 17-7 lead early in the third quarter. Alabama started the drive off with an incomplete pass, then the worst completed pass of the night, which ended up a six-yard loss thanks to a Ben Boulware suplex tackle. Then, things started breaking Bama’s way. Jalen Hurts scrambled away from pressure and found ArDarius Stewart for 15 yards. Damien Harris then broke through the line for a fourth-down conversion. On the very next play, Steve Sarkisian called for a trick play, a double pass from Stewart to O.J. Howard. Like Sark’s last call for Howard, it worked out perfectly and Bama gouged out a huge chunk of yardage. One play later, Hurts escaped. Alabama did not, of course, win. Hurts never got the ball back after that last heroic drive. His 30-yard scamper and Stewart’s pass (which he hung in and took a shot to get off in time) were all for nothing as Deshaun Watson drove Clemson down for the win. 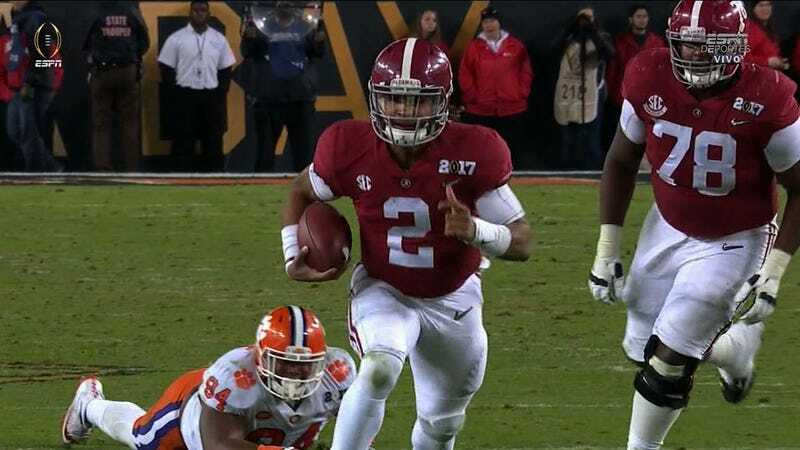 Clemson’s eventual victory was that much more impressive because they overcame the sort of relentless drive that Alabama ends games with routinely.